This tart will always manage to look beautiful on a Summer table. Taking inspiration from a French recipe where mustard forms a really delicious base for your veg to sit on top of, this makes for a really tasty lunch or add in some boiled new potatoes and salad for dinner. A mix of different tomatoes sitting on top with basil leaves makes it look delicious too! 2. To make the pastry, in a large bowl, rub the margarine into the almonds and flour. Add the thyme and bring together to form a ball. Roll out and use to line a greased baking tin. A Loose bottomed tin works best or you could use a large flat sheet. Bake for 5 – 10mins until firm and part cooked. 3. For the topping you can use as much veg as you like – just pile them up! Whilst the pastry is cooking steam the spinach or chard until tender and roast the sliced courgettes until slightly soft. 4. Remove the pastry from the oven and spread on a few tablespoons of Dijon mustard. 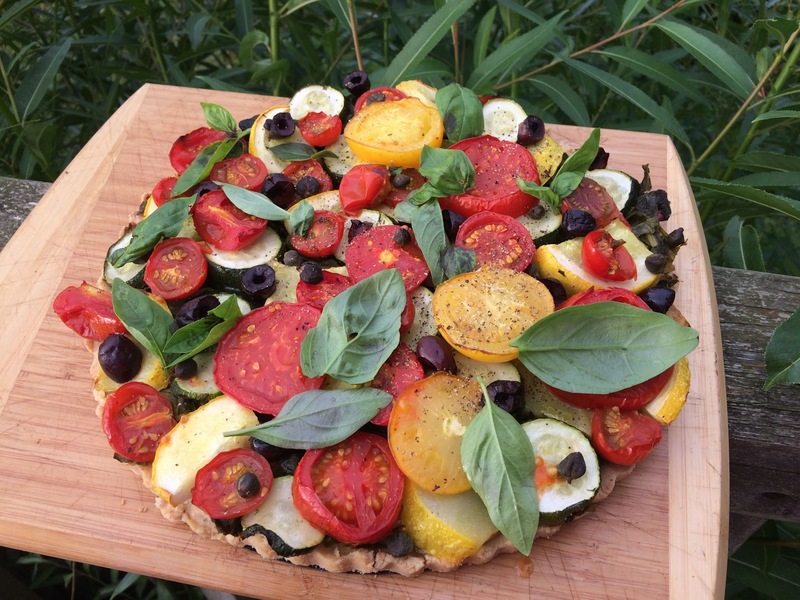 Top with the well squeezed spinach or chard, courgettes and sliced tomatoes, olives pitted and halved and a tablespoon of capers. 5. Drizzle over some olive oil and bake for 15 -20 minutes until hot and the pastry is cooked. Scatter over a handful of basil leaves and serve!